Godfrey is a gargoyle living at the top of the cathedral. One day, a passing scatter-brained Pigeon who has lost his way, lands on Godfrey’s head. Surprisingly, Godfrey and the Pigeon become friends. They spend an evening stargazing at various sky wonders such as the Moon, the Pole Star, the Great and Little Bears, comets, the Milky Way and the Northern Lights. 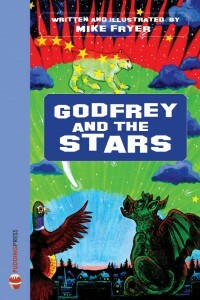 Godfrey and the Stars is the first title in the Godfrey series. The other titles are: Godfrey’s Flying Adventure and Godfrey’s Clever Inventions. 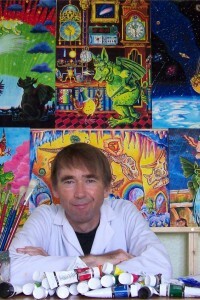 The Godfrey series, illustrated and written by Mike Fryer, are published under the PUDDING PRESS imprint. The Godfrey books were inspired by Mike’s visit to the Gothic splendour of York Minster, with its fantastical gargoyles that cram the sky-grazing buttresses, towers, walls and ledges, each and every gargoyle accompanied by a pigeon sitting on its head! What would gargoyles say if they could speak, what tales could they tell, staring out day after day, night after night from their lofty perches with their heads in their hands? Maybe they’d watch the weather and the stars and be very clever! They’d be astronomers, maybe even inventors, living at the tops of their towers with only the birds for company. And so, a few sketches later, the character of Godfrey the Gargoyle was born and with him, his cheeky side-kick the Pigeon and their adventures finally came alive!